The Hayward Municipal Band has entertained the people of Hayward and the East Bay for more than 60 years. The band's performances, held in Hayward's Memorial Park (behind the Hayward Plunge), begin at 2:30 p.m. on Sunday afternoons each summer. The band was started by two Hayward maintenance employees, Ed Mendonca and Tony Nunes, in 1957. In 1960 Tony Morelli became the director and conducted the 40-member professional group until his death in February of 1998. His daughter, Kathy Maier, who had been the assistant conductor, stepped in and has been the conductor for more than 15 seasons. We hope have each Sunday’s program on the Web site by the middle of the week before each concert. We look forward to playing for you and seeing you in the audience. 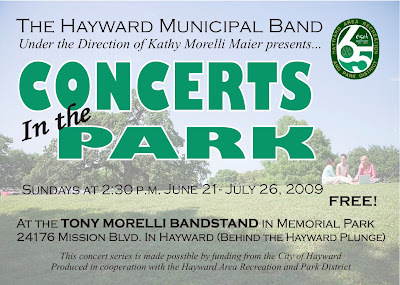 Concerts of the Hayward Municipal Band are furnished by the City of Hayward and the Hayward Area Recreation District. The band is grateful to Pastor Eldred and the parishioners of Fairway Park Baptist Church for making our concerts possible by providing us with a rehearsal and storage area. Thanks also to all of our audience members for your loyal and enthusiastic support.